Sand anchor stops umbrellas from blowing away. Accommodates beach umbrellas using thumbscrew tightening. 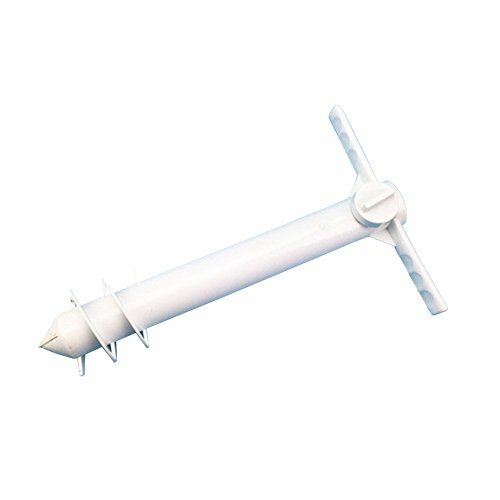 Package Includes 1x beach umbrella sand anchor. High Quality: Built with sturdy ABS construction. No worry about salt and sand corrosion. No cracking and rust free. Safe Use: Our super sturdy sand grabber spike is windproof, can withstand strong winds. No more harmful SPF or UV sun rays. Details aren't sharp like metal anchors, safe for children. Easy Installation: The comfortable handles increase torque to allow users to turn the unit easily. Simply screw the auger into the sand, dirt or grass, place your umbrella in the base holder, tilt accordingly, and enjoy. Wide Application: The universal base fits all umbrella pole sizes. Compatible with Tommy Bahama, Coleman, Nautica & Rio brands. Light Weight: Made with plastic material, it's light weight and portable.